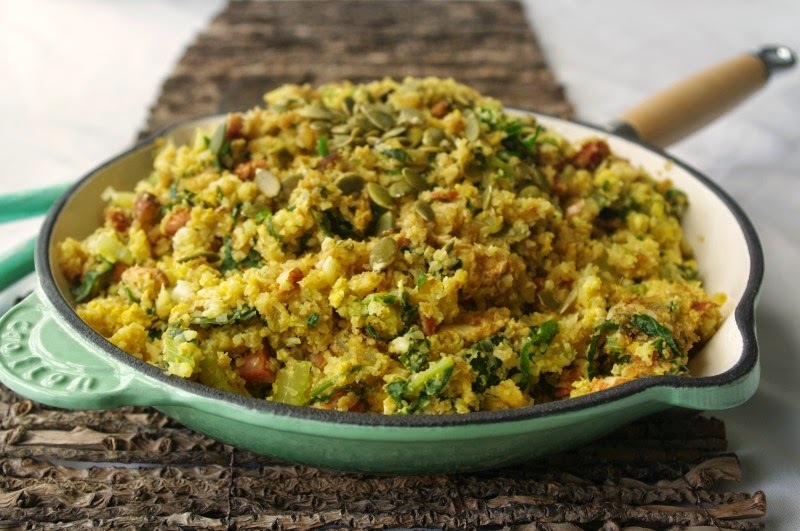 Cauliflower is not usually for everyone, but this spiced cauliflower rice may just change your mind. 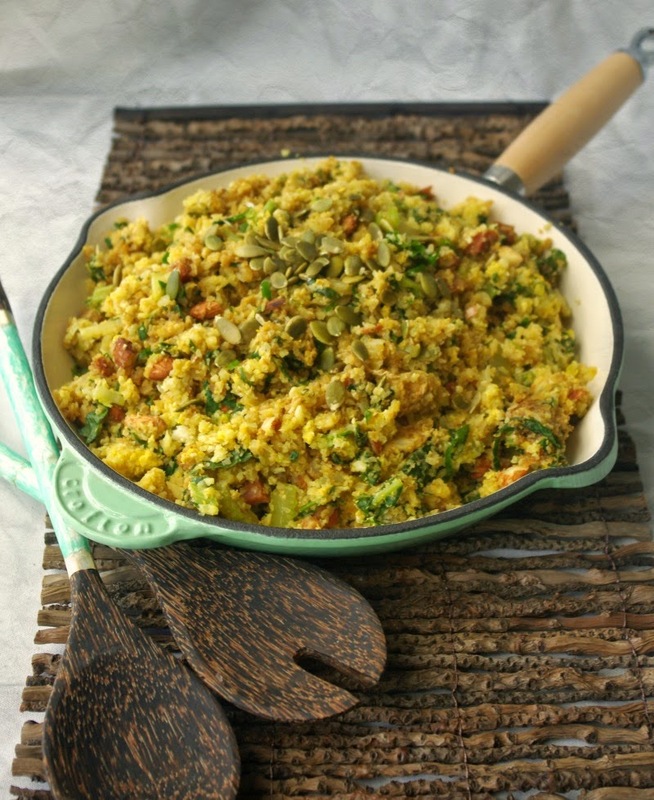 It is adapted from the Healthy Chef's Cauliflower Fried Rice and makes a filling and cheap alternative to a fried rice dish and with the addition of spice and chorizo it makes for a healthy dish full of flavour. You could use bacon instead of chorizo or leave the meat out all together to keep it vegetarian. The original recipe uses spring onion and tamari instead of chives and soy sauce. You can use any green leafy vegetable - kale, spinach, silverbeet. You can also grate the cauliflower if you don't have a food processor. It's a good meal to fit in to help balance the excesses of Christmas! Place almonds and 1-2 tbsp of soy sauce in a hot pan and toast for 1-2 minutes until they are crisp and fragrant. Remove and set aside. Add the cauliflower and silverbeet and stir fry until hot. Add the two beaten eggs and mix through. Top with almonds and pumpkin seeds. 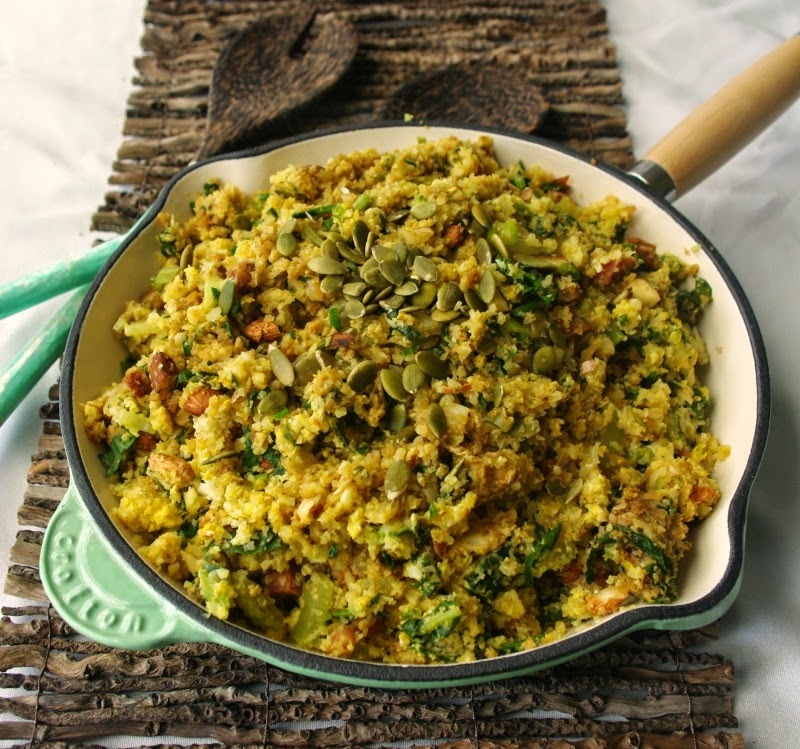 This would have to be the best cauliflower rice recipe I have come across, it looks amazing! We've got some chorizo in the fridge that needs to be used, I'm going to have to get some cauliflower so I can try this! I've had less success with cauliflower pizza bases and other recipes that require you to wring the water out of the cauliflower, but this works well and is easier. Cauliflower really likes turmeric - my two favourite cauli recipes, this and a curry, both use turmeric. There is not a single thing I can fault in this recipe - I love all those ingredients. Definitely trying this one out soon!